Deal – If you are planning to visit Wet n Joy Water Park Lonavala then you can buy voucher here. You will get upto 25% discount per ticket in Wet n Joy Water Park Lonavala Deals & Offers on entry tickets\pass\voucher. Use below coupon code to get cashback. There are various offers running for Wet n Joy water park deal. 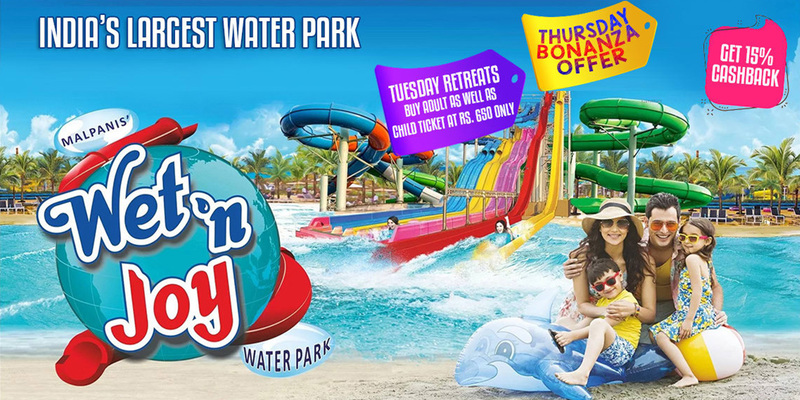 There is an offer Special day offer, where you can buy Wet n Joy water park on Thursday and Thursday for Rs.650 only and apart from this cheap rate, you will also get extra 10% discount when you use coupon code. There is an offer when you buy more than 4 ticket, you will get 25% discount. There is an offer when you buy more than 4 or less ticket, you will get 15% discount. Monday to Sunday: 10 A.M. to 6 P.M.
* Monday to Sunday: 10 A.M. to 6 P.M.
1. Get FLAT 25% OFF on 5 or more Tickets. 2. NOT Valid on Tuesday & Thursday. 3. Use coupon Code: BE25. 4. It is a Limited Period Offer. a. Select Date of Visit from Calendar. d. Please apply respective code to avail the exciting discounts. e. After the Payment, you shall receive a TRANSACTION ID via SMS as well as an EMAIL which you need to carry (no HardCopy required). You need to present the Transaction ID over the counter to collect the tickets. Limited Period Offer!! Grab Now!! 1. Pay with PayPal and get 20% cashback voucher up to Rs. 400 on your eligible purchases. 2. You will need to transact for a minimum value of Rs. 50 on selected Indian merchants www.beyondenough.in to be eligible for the offer. 3. Offer is valid only for new PayPal user’s first transaction on PayPal and can be availed once per PayPal user. 4. Offer is valid for transactions through your PayPal India account. 5. Offer valid for transactions from 28 Feb 2019 till 31st March, 2019. 6. The cashback voucher will be in the form a discount. Please see the Terms and Conditions below for more details. 7. This offer is valid on all merchants accepting PayPal except those running other exclusive offers from PayPal. 8. Cashback voucher will be credited in user’s PayPal account, within 24 hours after successful transaction with PayPal. 1. Create your PayPal India account on www.paypal.in. 2. Pay with PayPal on eligible Indian merchants accepting PayPal except merchants running specific offers. 4. Proceed to the payments page and select PayPal as your payment option. 6. Cashback voucher will be credited in user’s PayPal account, within 5 days after successful transaction with PayPal. 7. You will receive an email notifying you about the cashback voucher in your PayPal account. 8. Cashback voucher can be used as a discount at any Indian merchant accepting PayPal within 60 days from the award date (date of email receipt). 9. The eligible cashback voucher amount will be automatically applied as a discount when you use PayPal to make your next purchase at any Indian merchant accepting PayPal. 10. Check your cashback voucher amount on www.paypal.com/myaccount/wallet . 1. Get FLAT 10% OFF on Tickets. 2. Valid only on Tuesday & Thursday Treat Tickets. 1. Get FLAT 15% OFF on Tickets. 2. NOT Valid on Tuesday & Thurday. 3. Use coupon Code: BE15. Nestled in the lush Western Ghats, Wet n Joy is a popular destination for Mumbai and Pune residents. Explore all 25 rides, including a wave pool of 60,000 sq.ft., India’s largest. Float down the Crazy River, or shake a leg at the rain dance station. Kids will love the Royal Castle, a giant aqua station with plenty of slides. There are four restaurants within the park that serve Maharashtrian fare, Italian, Indian, and Chinese cuisine. Food stalls whip up ice golas, roasted corn, popcorn, and more. Thunder Waves – 60,000 sq. feet wave pool is no less than a real beach. Royal Castle – India’s biggest Aqua play station. Rain Dance – Rain shower, thumping music & unlimited fun. Crazy River – The crazy river gives your floating tubes enjoyable waves. Fungama – all our tiny-tot guests never want to get. Cyclone – Experience the Aqua cyclone with a mind-blowing twist. Nightmare – Love to go above & beyond to have some fun? Whizzard – The easiest water sport ever. Mat Racer – Compete with your friends over a mat based ride. Slide down from 58 feet while facing towards the slope. SkyFall – A free fall from 68 feet and travelling a never ending 324 feet slide enjoy this Fall from the sky through a splash. Master Blaster – Enjoy the ride on your tube from the height of 51 feet and travel through a topsy turvy journey of almost 700 feet. Extreme Volcano – It’s a volcano with a wave based Xtreme River. Hop on to a tube and face the Volcano which gushes out Lava like waves in the Xtreme River giving you Xtreme experiences of waves. Boomerango – Join your partner on a tube for a long journey through curvy tubes from the height of 47 feet. Travel through 369 feet while having a Boomerang effect towards the end. The ride slides you up through a large pan and giving you a feeling of defying Gravity before you come down splashing to reality. Tornado – The rattling slide through various tunnels. Expect the unexpected through a series of tunnels and tornados ahead of you. Free Fall – Just close your eyes, fold your hands and gather your courage to take a free fall from the height of 69 feet with a surprise 90 degree incline. It is mandatory for all visitors to take shower, before entering the water park rides. You may bring costumes from your end or purchase/hire from the park. The costumes must be of Nylon or Lycra only. Costumes can be bought from the park or can be used on Rent. On Rent, they provide costumes @ Rs.200/- inclusive of taxes per costume. A refundable cash deposit of Rs.100/- has to be paid extra. V-cut , U-trunk swimwear not allowed. Beach shorts / Jammers / Tights allowed (in polyester/nylon) ONLY. Water park wear also available for sale in stores. SalwarKameez Sarees strictly not allowed. Swim wear/ Tights & Tees allowed (In polyester/nylon based fabrics). Swim wear/ Beach wear in polyester/nylon allowed. WetnJoy Water Park does not take responsibility of any damage/loss of your valuables. We have offered Locker facility for the same, which can be utilized to keep your valuables safe. We provide Baggage Counter facility, at no extra cost at the entry gate. However, Lockers in the changing rooms are charged extra @ Rs.200/- inclusive of taxes per Locker. A refundable cash deposit of Rs.100/- has to be paid extra. They offer separate blocks for Changing Rooms & Lockers rooms for Ladies and Gents, besides the locker and rest room facility. I WANT TO BOOK 7(5A,2C) TICKETS OF WET N JOY LONAVALA, PLEASE HELP ME WITH THE 1000 RUPEES DISCOUNT COUPON. I WANT TO BOOK 7(5 ADULT 2 CHILD) TICKETS OF WET N JOY LONAVALA, PLEASE HELP ME WITH THE 1000 RUPEES DISCOUNT COUPON. I WANT TO BOOK 4 TICKETS OF WET N JOY, PLEASE HELP ME WITH THE 1000 RUPEES DISCOUNT COUPON.